The Livonian Knight order or the Order of the Sword Brothers (official name Lat. "Fratres militia Christi") was a German knight order in Livonia (modern Latvia and Estonia) founded by Bishop Albert of Riga in 1202 for the purpose of conquest and Christianization in the Baltic lands. The knights were organized similarly to the older Teutonic Knights. In 1236 the knights were severely defeated by the Lithuanians; as a result they merged (1237) with the Teutonic Order, but they continued to form a separate state.After the secularization (1525) of the Teutonic Order, they resumed independence. In 1558, Czar Ivan IV (the Terrible) of Russia invaded their territories, which were eventually partitioned between Russia, Poland, and Sweden. In 1561 the knights were disbanded; their grand master became the first duke of Courland under Polish suzerainty. However, the knights retained their vast estates in the Baltics. 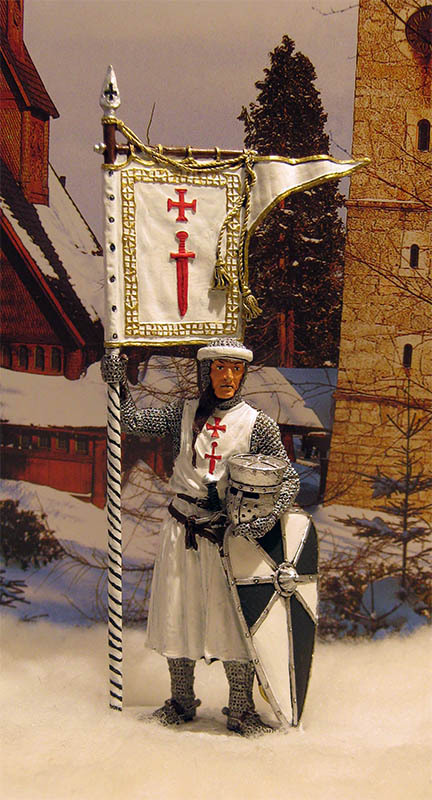 Knight of the Order of the Sword Brothers (Livonian Knight), EK Castings, tin, size 54mm.